Alex was older according to the happenstance of birth, but both young men had been dead now for well over a century. “Not that queer machine?” queried Marion. She shook her head in disbelief. Sometimes I think I’m mad, she thought. But yet . . . I know they’re here. Around. Some. How. Marion gripped the sill of the portal, leaning out as far as possible in an effort to scan the world roiling below him. “It’s a golderned calamity, isn’t it?” he muttered. Ruth leaned over the porch railing. Her mind had wandered from the frustrating writing task to the lilting melodies of nearby songbirds—unseen but heard. So soothing, she thought. The slightest of breezes caressed her face, breaking her reverie. She brushed back whispery strands of gray hair and turned to gaze in its direction. 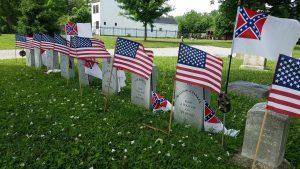 They are buried together in the Linden Grove, a cemetery in Covington, Kentucky. Union. Confederate. The boys of 1861 forever face one another across a grassy divide. Most are veterans of locally formed volunteer regiments: infantry, cavalry, mounted infantry. 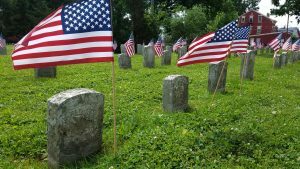 Kentucky is where South met North; or, as historian Bruce Catton wrote, where they “touched one another most intimately.” And Linden Grove is one of very few cemeteries in this nation which honors all of its boys who served their country. For all were true Sons of Kentucky. From the 1850s well into the Reconstruction years, Kentucky was divided in its loyalties and politics, experiencing partisan strife and violence (sometimes under martial law). 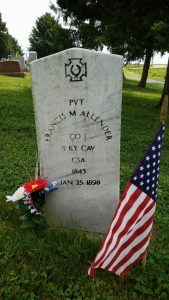 Most Sons of Kentucky served in the Union army. About 100,000 Kentuckians answered the call to arms for the Union cause—less than half that for the Confederacy. Recruiters had poured across the borders in an effort to solicit men for both sides. There were two governments and two governors in the state (commencing in late 1861), one duly elected to uphold the Constitution and the Union—the other a shadow government. Covington, the site of Linden Grove, is arguably the northernmost city in the State of Kentucky. It sits directly across the Ohio River from Cincinnati. Prior to the Civil War there was not one bridge that spanned the river, but that hardly mattered. The river certainly did not provide a perfect border between North and South. Powerful cultural bonds grew between Southern Ohio and North Central Kentucky beginning with the time of pioneer settlement following the American Revolution. People routinely traveled from one side of the river to the other. It was a common occurrence that linked families and promoted growth and commerce. Yet, Kentucky was never Ohio. Vast numbers of those men and women in flatboats were specifically setting out for the new State of Kentucky, their eyes set on lands bounding the Maysville Road (which ran from the river to Lexington). And where were they predominantly from? Virginia, and what is now West Virginia. Others came from Maryland, Pennsylvania and points north, of course. At about the same time of Ohio River migration settlers were pouring through the Cumberland Gap, in to the lands of southern and western Kentucky. Most of these folks were coming from deeper in the southern region of the country—few from the North. By the time fifty or sixty years had passed, Kentucky was a state with undeniable bonds with the North but deep roots in the South. No wonder its sons were torn. It truly was a state that pitted brother against brother, and cousin against cousin. For example, the great statesman from Kentucky—Henry Clay—had three grandsons that wore Union blue and four who fought in Confederate gray. 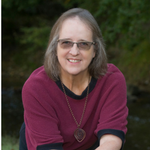 In the book which I am currently researching, I weave the story of two sets of cousins from my ancestry who resided in North Central Kentucky. Three of the young men chose to enlist in various Union regiments, but the fourth would ride with the Kentucky 8th Cavalry (CSA), a regiment under the famed General John Hunt Morgan. These cousins and brothers literally faced off at Murfreesboro/Stones River and within their native state. It’s an amazing story with unimaginable suffering. The lead character of my current book, Jesse: 53rd Kentucky, was familiar with them all. Corporal Jesse J. Cook rests in the Linden Grove. I visited him and his comrades-in-arms (North and South) over Memorial Day weekend. The iconic John A. Roebling Bridge has spanned the waters of the Ohio River between Covington and Cincinnati for over 150 years. It is a National Historic Landmark, still serving both pedestrian and vehicular traffic. The first charter for the Covington-Cincinnati Bridge Company was granted by the Kentucky Legislature in 1846. (Kentucky owns the Ohio River—basically to the Ohio shoreline.) Due to intense opposition from ferryboat operators and steamboat companies, construction was delayed for ten years. There were also fears that a bridge would aid runaway slaves in reaching the North. At the outbreak of the Civil War the towers on either side of the river were under construction. 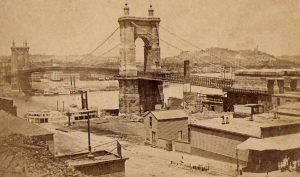 John Roebling had been hired early in the process to design the bridge. His son, Washington, was the engineer on site, who oversaw the construction and dealt with problems at hand. The project slowed during the first years of the war. Besides financial setbacks, both state legislatures had to approve lowering the required clearance of the bridge over the water. In 1863, work on the towers resumed, and continued through 1864. (This is when my character Pete Strong would have been employed on the crew.) Spinning of the cables began in November 1865 (meshing nicely with Jesse’s discharge from the army in September when he’s hoping to see construction of the bridge accelerate). Jesse, Eliza, and the rest of the Cooks were surely among the 166,000 people from Kentucky and Ohio who crossed the bridge on its opening weekend in early December 1866. They no doubt marveled at the then longest bridge in the world—later to be surpassed by Roebling’s other bridge in Brooklyn.